Shot these for my real job working on the blog and social media for Metro, the big transit agency serving Los Angeles County. The agency also owns one of the neatest buildings in town, Union Station, and the pics are part of a promotion in conjunction with the Music Center. I shot these on the fly without much preparation (I had just returned from vacation late the previous night). All in all, I'm very pleased with them and the top photo is one of my favorites of the year thus far. 1. I might have been more careful about some of the architectural items in backgrounds being too close to the ballerinas. 2. 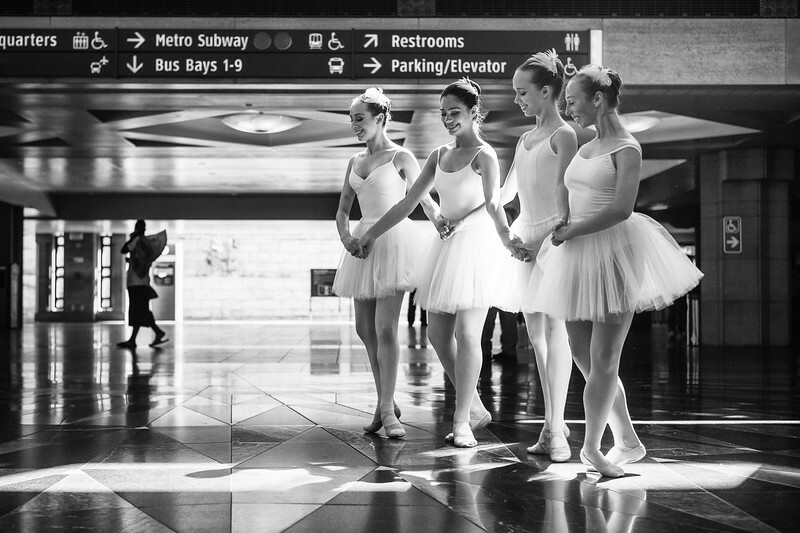 I probably missed some opportunities to capture reflections of the ballerinas in the tile floor. In hindsight, I also wish I had brought a step stool or short ladder so that I could a little higher and maybe find an interesting vantage point. All that said, I'm still pretty happy with the photos and both the agency and client liked them. All photos were shot with my Nikon Df and the Nikon 50mm 1.8 lens. I processed in Lightroom using some VSCO film presets and Nik Software's Color Efex Pro 4. The entire set is on the Metro Flickr page.